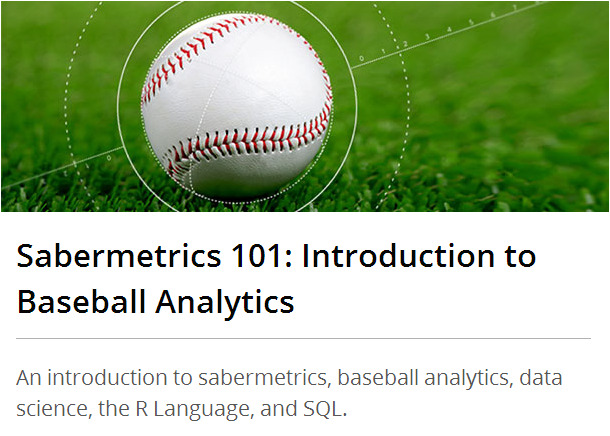 This course will cover the theory and the fundamentals of the emerging science of Sabermetrics. We will discuss the game of baseball, not through consensus or a fan’s conventional wisdom, but by searching for objective knowledge in hitting, pitching, and fielding performance. These and other areas of sabermetrics will be analyzed and better understood with current and historical baseball data. The course also serves as applied introduction to the basics of data science, a growing field of scholarship, that requires skills in computation, statistics, and communicating results of analyses. Using baseball data, the basics of statistical regression, the R Language, and SQL will be covered. This course has been successfully taught at the Experimental College at Tufts University since 2004. Many of its former students have gone on to careers writing about baseball and working in various MLB baseball operations and analytics departments. The course is free to audit, or you can take it for $25. I'm signed up to audit it. That said, given that I really do need an excuse to get acquainted using R for my day job, I'm strongly considering taking it for credit. I don't really see why I couldn't claim this as a continuing education line on my annual report! I will, no doubt, be posting here as I work through the course. I'm not really sure how the format of the course will work--I've never taken a massive open online course like this before. But I'm guessing (hoping?) there will be assignments, even if they are not graded, and I can post the results of little projects I get to do. If nothing else, there should be plenty of fodder for topics, insights, and ideas. I'm guessing that a lot of stuff will be basic introductory content, but I like seeing how a good introductory course is put together...and it might be helpful if I ever get to teach my Science of Baseball class again. Should be fun! Glove slap to Ben Nevis.